Illustrations: 28 b&w illustrations, 3 maps, and 14 tables. The kea, a crow-sized parrot that lives in the rugged mountains of New Zealand, is considered by some a playful comic and by others a vicious killer. Its true character is a mystery that biologists have debated for more than a century. 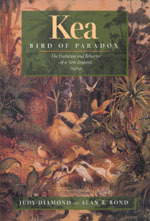 Judy Diamond and Alan Bond have written a comprehensive account of the kea's contradictory nature, and their conclusions cast new light on the origins of behavioral flexibility and the problem of species survival in human environments everywhere. New Zealand's geological remoteness has made the country home to a bizarre assemblage of plants and animals that are wholly unlike anything found elsewhere. Keas are native only to the South Island, breeding high in the rigorous, unforgiving environment of the Southern Alps. Bold, curious, and ingeniously destructive, keas have a complex social system that includes extensive play behavior. Like coyotes, crows, and humans, keas are "open-program" animals with an unusual ability to learn and to create new solutions to whatever problems they encounter. Diamond and Bond present the kea's story from historical and contemporary perspectives and include observations from their years of field work. A comparison of the kea's behavior and ecology with that of its closest relative, the kaka of New Zealand's lowland rain forests, yields insights into the origins of the kea's extraordinary adaptability. The authors conclude that the kea's high level of sociality is a key factor in the flexible lifestyle that probably evolved in response to the alpine habitat's unreliable food resources and has allowed the bird to survive the extermination of much of its original ecosystem. But adaptability has its limits, as the authors make clear when describing present-day interactions between keas and humans and the attempts to achieve a peaceful coexistence. Judy Diamond is Associate Professor and Assistant Director for Public Programs at the University of Nebraska State Museum. Alan B. Bond is Research Professor of Biological Sciences at the University of Nebraska.